Goodreads description--In the beginning, there's a boy standing in the trees . . . . 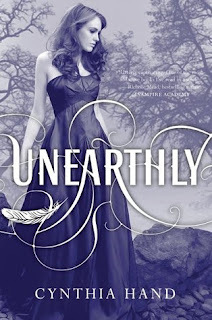 I've got mixed feelings about Unearthly. For the most part, I enjoyed it. Angel books are nothing new, but this one felt like what an angel book should be. For one, this wasn't a story about a fallen angel who happens to be a really hot guy. Of course, fallen angels, or Black Wings, do make an appearance in Unearthly, but at this point, the story doesn't focus on the fallen. Clara's a sixteen year old, quarter-angel, girl. Her mother is a half-blooded angel and her father is human. Clara's mother told her the truth about their background when Clara was fourteen years old and ever since Clara's been waiting on receiving her purpose--IOW, her purpose in life, her mission. Considering most of the other angel books I've read are just about fallen hot angel boys, it was refreshing for Cynthia Hand's angels to have a mission--a purpose from God. And Clara's mother does a great job showing that the purpose is the priority in their lives, so much so that they move across country in order to accomplish this purpose. The additional cast of secondary characters include Clara's younger brother Jeffrey who I expect we'll hear much more about in the future books, her mother who also has more information to spill, Angela who's the only person that really understands what Clara's going through--expecting further developments concerning her research--Wendy who is one of Clara's a BFFs, her twin brother Tucker, and Christian--Clara's purpose. Unfortunately, I'm not sure I like the direction the story is headed in. I was all pumped about the fact that these angels have a purpose, a mission from God. I was pumped that they don't outright deny the existence of God, and there were moments when I was impressed with Cynthia Hand for touching on their belief of God and all of that jazz. However, without getting too spoilery, this book plays with the concept of "what happens if an angel decides that they want to follow a different path than the one they've been destined for?" And well...I'm not sure what happens in this series to these angels, but I know what happens to ones that think they know better than God. And I guess for once I'd like to see a YA novel about angels actually stick to the truth in this area. I've argued that fiction is fiction and that we shouldn't take it too seriously at times, but I've been frustrated with repeating patterns in fiction lately. So I'd be happy to see the Unearthly series break pattern. I'll definitely continue the series, but we'll have to see what happens in book 2 before I can say that I'll certainly finish the series. All in all I give Unearthly a wary 4 stars. I feel as if I can't give an accurate representation of my feelings toward the book without spoilers, so I'm just saying that I enjoyed Unearthly, but I am a bit uneasy about the direction in which the story is headed. Have you read Unearthly? What did you think? Let me know! I really loved this series so sad it is all over now!